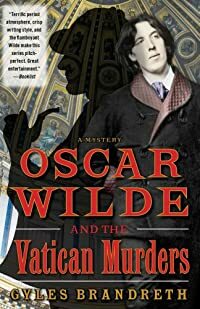 Oscar Wilde and the Vatican Murders by Gyles Brandreth: Synopsis and Online Purchase Options. Synopsis (from the publisher): In 1892 an exhausted Arthur Conan Doyle retires to a spa in Germany with a suitcase of fan mail. The first person he encounters is Oscar Wilde, and when the two friends make a series of macabre discoveries among the letters—a finger, a lock of hair, and, finally, an entire severed hand. The trail leads the intrepid duo to Rome, and then to a case that involves miracles as well as murder. To discover why they have been summoned to the Vatican in this sinister fashion, Wilde and Conan Doyle must uncover the deadly secrets of the six men closest to the pope.